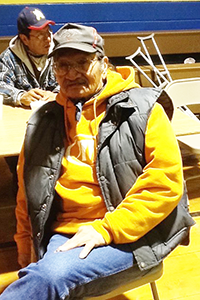 Francis “Chubbs” Thunder Hawk is one of most well known, revered, and respected elders on the Pine Ridge Reservation. He is continually on call to help others and is always traveling all over the reservation to serve his community in a sacred way. He has been overseeing the plans for this years Ride and Memorial Ceremony. Chubbs has been singing and leading prayers and ceremony for the Big Foot Band Memorial Ride since 1988. Over the years he has written and sang many songs for the Riders, the Ancestors, and for healing. He is one of our Honored Elders.